We love salsa…all salsas. 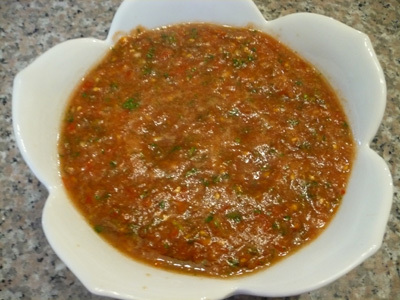 I think the hardest salsa to make is red salsa–I’m not sure why, but most of the time when we make red salsa at home it’s good but just not memorable good. Green salsas on the other hand almost always turns out great…go figure! Anyway, I got this recipe from my friend Mary, who got the recipe from a lady in El Paso, and it really is excellent—yes it’s that good….FINALLY!!!! Start slowly with the jalapenos as all jalapenos vary in heat. You may also want to add more lime juice and/or salt. The flavors definitely meld after the salsa has been refrigerated for hours, so try to make this one in advance—it’s worth it! Blend all ingredients. Taste and adjust seasoning, if necessary.